I'm curious what my conservative friends thought of the Bush administration's intentional snubbing of the Tiawanese president last week. The United States decided to bar a stopover by Taiwanese President Chen Shui-bian on his way to Latin America to avoid angering China, whose backing for UN action against Iran is critical, analysts said. In an apparent rebuff, Chen completely dropped plans to transit in the United States after Washington said he could only make a refueling stop in Alaska rather than New York or San Francisco as requested by him. Chen instead made transit stops in Abu Dhabi and Amsterdam en route to Paraguay and Costa Rica, two of only 25 nations that recognise Taiwan diplomatically. We won't even let the Taiwanese president stay overnight in the U.S. for fear that it might annoy China and then they might not go along with our war-monging plans against Iran at the U.N.
Is this the same administration that claims that sacrificing thousands of U.S. lives and spending billions in tax dollars to promote democracy is a most worthy goal? And yet we turn our back on democratic Taiwan and shamelessly kowtow to the brutal totalitarians in China so we can advance a questionable foreign policy goal against Iran? Are the pro-democracy conservatives upset by this? Or do they see it as a necessary sacrifice and compromise toward a larger goal? Which is it? It looks like there are a lot of good movies coming out this summer. Mission Impossible III Tom Cruise may be a loopy Scientologist, but he is still a good actor and I really enjoyed the first two films in this series. The Da Vinci Code All controversy aside, I don’t see how you can go wrong with Ron Howard directing and Tom Hanks starring. X-Men 3: The Last Stand I’m also a fan of this series and am looking forward to the next installment even if it does have a lame subtitle. Cars Pixar + Disney = Blockbuster hit. Any questions? Superman Returns In a brilliant casting move, the director found someone who looks just like Christopher Reeve. That’s all they will need to sell this movie. James Bond movie In a brilliant casting move, the director found someone who doesn’t look anything like James Bond. That’s all they will need to sell this movie. Pirates of the Carribbean: Dead Man’s Chest Another can’t miss sequel, especially since they kept the original cast together. United 93 One of the two great stories to come out of 9/11 was the heroic struggle of these airline passengers to divert their hijacked plane from its intended target. World Trade Center The other great story is about the cop and port authority officer who survived the collapse of one of the towers. Helmed by Oliver Stone who needs a hit to redeem himself after the lackluster response to Alexander. First John Kenneth Galbraith and now Louis Rukeyser is gone. It is a sad time for fans of popular economics. Louis Rukeyser, a best-selling author, columnist, lecturer and television host who delivered pun-filled, common-sense commentary on complicated business and economic news, died Tuesday. He was 73. 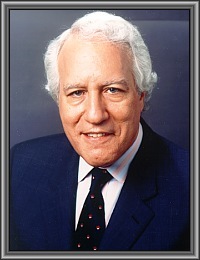 As host of "Wall $treet Week With Louis Rukeyser" on public TV from 1970 until 2002, Rukeyser took a wry approach to the ups and downs in the marketplace and urged guests to avoid jargon. He brought finance and economics to ordinary viewers and investors, and was rewarded with the largest audience in the history of financial journalism. My wife grew up listening to Rukeyser every evening as Wall Street Week was her father’s favorite TV show. I came to appreciate the man later in life and was outraged when he was summarily dumped by PBS back in 2002. In response, I wrote this column for the San Antonio Business Journal. The AP reports that more professors are banning laptops in classrooms. I say more power to them! As the professor lectured on the law, the student wore a poker face. But that was probably because, under the guise of taking notes on his laptop, the student actually was playing poker - online, using the school's wireless Internet connection. Well, at least the student showed up for class. That’s more than you can say about most of the students taking my wife’s chemistry classes at UT San Antonio. I think there are something like 200 students enrolled in one class and on any given day about one-third will bother to show up. It really amazes me what students today think they can get away with. I wasn’t the ideal student when I was in college by any means, but I would at least show up to class 90 percent of the time. I would try and limit myself to no more than one absence per class per semester for any reason. But these students today only show up to take the exam and then they have the gall to complain when they make a failing grade. They don’t attend lectures, they don’t do their homework and then they expect the professor to curve the grades or give them enough extra credit to slip by. It is really pathetic. Stephen Colbert’s performance at the Washington Correspondents dinner is already legendary. It was delicious satire as has rarely been pulled off for a captive audience at that level of society in Washington. It was a performance so masterful and struck home so forcefully that it left the Washington elite politicos and media dumbfounded. Some responded indignantly, whining that Colbert had “gone over the line.” Others tried desperately to ignore it the next day like New York Times reporter Elizabeth Bumiller who didn’t even mention Colbert in her story the next day. Absolutely pathetic. That’s like going to a Bruce Springsteen concert and writing your review about the opening act. If the Washington elite media was anxious to downplay Colbert’s performance, it’s not hard to understand why. I am appalled to be surrounded by the liberal media that is destroying America, with the exception of Fox News. Fox News gives you both sides of every story: the president's side, and the vice president's side. But the rest of you, what are you thinking, reporting on NSA wiretapping or secret prisons in eastern Europe? Those things are secret for a very important reason: they're super-depressing. And if that's your goal, well, misery accomplished. Over the last five years you people were so good -- over tax cuts, WMD intelligence, the effect of global warming. We Americans didn't want to know, and you had the courtesy not to try to find out. Those were good times, as far as we knew. But, listen, let's review the rules. Here's how it works: the president makes decisions. He's the decider. The press secretary announces those decisions, and you people of the press type those decisions down. Make, announce, type. Just put 'em through a spell check and go home. Get to know your family again. Make love to your wife. Write that novel you got kicking around in your head. You know, the one about the intrepid Washington reporter with the courage to stand up to the administration. You know - fiction! Ouch!! No wonder Busmiller wanted to ignore Colbert’s tour-de-force performance. It was aimed right at her. Fortunately, Dan Froomkin at the Washington Post has the best round-up of the story to somewhat make up for the deafening silence and blackout it has recieved elsewhere. President Bush on Saturday night had the audience at the White House Correspondents' Association Dinner in stitches. With doppelganger comedian Steve Bridges alongside -- playing his inner self -- Bush poked gentle fun of his own mangling of the English language, his belligerence and his feelings about the media. Then Comedy Central satirist Stephen Colbert ripped those stitches out. Colbert was merciless, reserving his most potent zingers for the people in spitting distance: The president who took the nation to war on false pretenses and the press corps that let him do it. The boozy bonhomie of the annual event is intended to serve as a balm for the often tense relationship between the White House and the reporters who cover it. Bush largely delivered on his side of the bargain. Colbert delivered something else entirely. 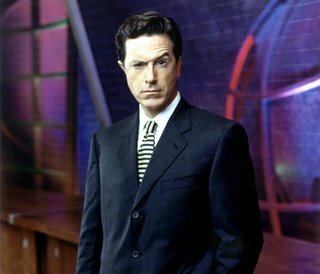 Colbert stayed in character as the bombastic, over-the-top, right-wing cable TV host he plays on the Colbert Report. "Now, I know there are some polls out there saying this man has a 32% approval rating. But guys like us; we don't pay attention to the polls. We know that polls are just a collection of statistics that reflect what people are thinking in 'reality.' And reality has a well-known liberal bias. . . .
You can watch the latter half of Colbert’s performance here (Including the video-taped routine with Helen Thomas). And you can read the entire transcript here. I think Billmon sums it all up best here. Colbert's routine was designed to draw blood -- as good political satire should. Colbert used satire the way it's used in more openly authoritarian societies: as a political weapon, a device for raising issues that can't be addressed directly. He dragged out all the unmentionables -- the Iraq lies, the secret prisons, the illegal spying, the neutered stupidity of the lapdog press -- and made it pretty clear that he wasn't really laughing at them, much less with them. It may have been comedy, but it also sounded like a bill of indictment, and everybody understood the charges. President Bush’s approval rating has been under 50 percent for more than a year now and is currently at an all-time low, so it is not surprising that there is a lot of Bush-bashing going on. But a lot of these critics are Johnny-come-latelys who are just jumping on the bandwagon now that it is deemed OK by the CW to show your disapproval of the president’s policies (although even now you still risk being labeled a traitor for doing so). But if you want to see real quality Bush-bashing of the highest level, you have to turn to the masters of the craft who have been honing their talents from the start. Start with Frank Rich who sliced and diced Bush in this Sunday’s NYTimes with his usual razor-sharp eloquence. LIKE the hand that suddenly pops out of the grave at the end of "Carrie," the past keeps coming back to haunt the Bush White House. Last week was no exception. No sooner did the Great Decider introduce the Fox News showman anointed to repackage the same old bad decisions than the spotlight shifted back to Patrick Fitzgerald's grand jury room, where Karl Rove testified for a fifth time. Nightfall brought the release of an NBC News-Wall Street Journal poll with its record-low numbers for a lame-duck president with a thousand days to go and no way out. The demons that keep rising up from the past to grab Mr. Bush are the fictional W.M.D. he wielded to take us into Iraq. They stalk him as relentlessly as Banquo's ghost did Macbeth. From that original sin, all else flows. Mr. Rove wouldn't be in jeopardy if the White House hadn't hatched a clumsy plot to cover up its fictions. Mr. Bush's poll numbers wouldn't be in the toilet if American blood was not being spilled daily because of his fictions. By recruiting a practiced Fox News performer to better spin this history, the White House reveals that it has learned nothing. Made-for-TV propaganda propelled the Bush presidency into its quagmire in the first place. At this late date only the truth, the whole and nothing but, can set it free. All too fittingly, Tony Snow's appointment was announced just before May Day, a red-letter day twice over in the history of the Iraq war. It was on May 1 three years ago that Mr. Bush did his victory jig on the aircraft carrier Abraham Lincoln. It was May 1 last year that The Sunday Times of London published the so-called Downing Street memo. These events bracket all that has gone wrong and will keep going wrong for this president until he comes clean. To mark the third anniversary of the Iraq invasion last month, the White House hyped something called Operation Swarmer, "the largest air assault" since the start of the war, complete with Pentagon-produced video suitable for the evening news. (What the operation actually accomplished as either warfare or P.R. remains a mystery.) It will take nothing less than a replay of D-Day with the original cast to put a happy gloss on tomorrow's anniversary. Looking back at "Mission Accomplished" now is like playing that childhood game of "What's wrong with this picture?" It wasn't just the banner or the "Top Gun" joyride or the declaration of the end of "major combat operations" that was bogus. Everything was fake except the troops. "We're helping to rebuild Iraq, where the dictator built palaces for himself, instead of hospitals and schools," Mr. Bush said on that glorious day. Three years later we know, courtesy of the Army Corps of Engineers, that our corrupt, Enron-like Iraq reconstruction effort has yielded at most 20 of those 142 promised hospitals. But we did build a palace for ourselves. The only building project on time and on budget, USA Today reported, is a $592 million embassy complex in the Green Zone on acreage the size of 80 football fields. Symbolically enough, it will have its own water-treatment plant and power generator to provide the basic services that we still have not restored to pre-invasion levels for the poor unwashed Iraqis beyond the American bunker.